Project Description: In 2002 the City of Wilsonville completed the construction of the Willamette River Water Treatment Plant. This plant was constructed with the specific intent to provide treated water to multiple regional water purveyors. Designed for a peak capacity of 30 million gallons per day and a working pressure of 250 psi, the Segment 3b transmission line was the last of several transmission projects connecting the treatment plant with the City of Sherwood. 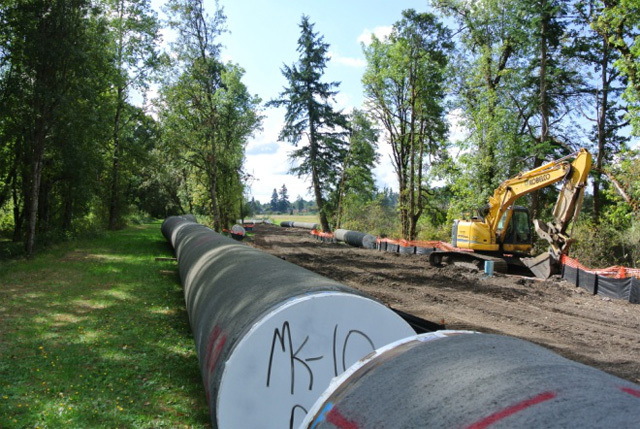 The project included 2,500 feet of 48-inch diameter steel pipe located in an alignment that passed through wetland and natural areas containing compressible soils and subject to a number of permitting requirements with the Oregon Department of State Lands and the US Army Corps of Engineers. The project included a 300 square foot pressure reducing valve vault and associated 24-inch diameter piping to supply water to a sector of Wilsonville’s distribution grid. Westech provided the design of the transmission line and vault, a cathodic protection system for the steel pipe, an instrumentation and telemetry system and assisted the City by providing construction period services.